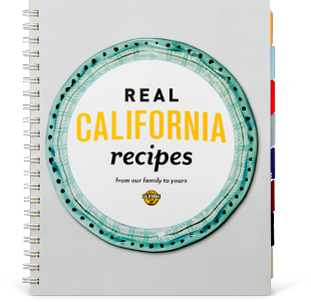 For a no-fail crowd pleaser, the California Milk Advisory Board recommends serving chili with an array of Real California Cheese toppings, from traditional Monterey Jack to specialty Hispanic-style manchego. Shredded cheese tastes great by itself, but it can also be mixed with fresh herbs and diced vegetables. Try cutting cheese into small cubes and tossing with shredded lettuce, fresh parsley and red onions for dramatically different topping. To make toppings that pack even more punch, use flavored cheeses like onion or jalapeno jack. In a large heavy bottom pot, heat oil and saute onion for 5 minutes, adding garlic after 3 minutes. Add meat, breaking it up with a fork to brown. While cooking meat, add 2 tablespoons of the chili powder and the cumin, oregano and thyme. When meat is cooked through, add tomatoes, breaking them up with a fork. Add tomato sauce and 2 cups of bean broth. Simmer, covered, for 40 minutes. Add beans, vinegar and wine. Heat thoroughly and season to taste with salt and pepper. Add remaining bean broth if soupy consistency is desired. 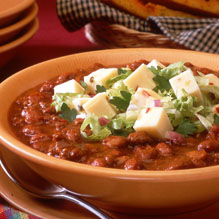 *If a hotter chili is desired, add the remaining tablespoon of chili powder or a portion of it. Per serving: 449 calories, 27.43 g protein, 62.6 mg cholesterol, 37.85 g carbohydrate, 880.4 mg sodium, 10.42 g fiber, 20.17 g total fat, 7.52 g saturated fat.